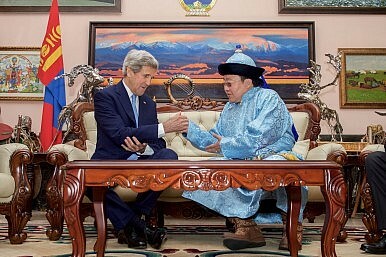 John Kerry instructed in the cultural practice of a snuff exchange by Mongolian President Tsakhiagiin Elbegdorj. In his brief visit on Sunday to the Land of the Eternal Blue Sky, United States Secretary of State John Kerry praised Mongolia as an “oasis of democracy” in a region with few examples. The trip by the top U.S. diplomat precedes parliamentary elections planned for June 29. Dozens of candidates are mounting campaigns for seats in the State Great Khural, a unicameral legislative body comprised of 76 members elected to four-year terms. In his official visit to the ancestral home of Chinggis Khaan, as the historical conqueror is known there, Kerry observed a traditional “naadam” sports festival consisting of wrestling, horse racing, and archery. He visited with the champion wrestler, awarded medals to winning riders, and fired arrows at targets during the exhibition. In a joint press conference on Sunday with Foreign Affairs Minister Lundeg Purevsuren, Kerry touted the young democracy as an example for other nations. Landlocked between communist China and increasingly authoritarian Russia, Mongolia celebrated 25 years of democratic governance last year, following nearly seven decades of Soviet-style socialism. Mongolia is the least-densely populated country in the world. Over a quarter of its more than 3 million citizens live nomadically, though the nation is rapidly urbanizing and adapting to the era of globalization. In his remarks at the Ministry of Foreign Affairs, Kerry extolled Mongolia for “sharing the lessons of its own evolution with other countries,” namely the budding democracies of Myanmar and Kyrgyzstan. The U.S. secretary of state also applauded the country’s global citizenship as evidenced by its active participation in the UN Human Rights Council, its contribution to peacekeeping troops in Sudan and South Sudan, and its recent joint-military peacekeeping exercise, Khaan Quest. Kerry also praised Mongolian troops’ combat roles in Iraq and Afghanistan. Amid a packed schedule filled with high-level meetings with President Tsakhiagiin Elbegdorj and cultural events, Kerry gently encouraged the Mongolian government to operate with greater transparency, especially in its dealings with foreign counterparts. Mongolia’s record on democracy and human rights came under scrutiny in the U.S. State Department’s 2015 Human Rights Report. “Vague laws and a lack of transparency in legislative, executive, and judicial processes undermined government efficiency and public confidence, and invited corruption,” stated the report in its executive summary. In his speech, Kerry nudged Mongolia to implement a bilateral transparency agreement signed in 2013, which has been slow to come to fruition. The agreement would require Mongolia to publish an explanation for any proposed regulation in English—at present an uncommon occurrence—and allow for public comments on those proposals, among other measures. Kerry called the transparency agreement “a very important step to be able to attract foreign direct investment” — which has all but disappeared from the country formerly dubbed “Minegolia” by international investors. Mongolia currently faces serious economic woes, many of which stem from a lack of transparency in its business regulations. Once the world’s fastest growing economy, the country has faced grave challenges in recent years. Fraught talks between international mining company, Rio Tinto, and the Mongolian government over the development of the Oyu Tolgoi mine, the world’s largest undeveloped copper reserve, stalled out the project for years and discouraged many potential investors. Falling global commodity prices in addition to wilting demand from China, Mongolia’s largest trading partner, have also compounded the country’s economic plight. The World Bank forecasted Mongolia’s rate of economic growth at a dismal 0.8 percent this year, down from a roaring 17.5 percent in 2011 at the height of the mining boom. Mongolia hopes that the upcoming Asia Europe Meeting (ASEM) and high tourist season will help stir the economy from its slumber. Kerry took no such opportunities to jab at neighboring China. In fact, he planned to meet immediately afterwards with Chinese officials as part of the China-U.S. Strategic and Economic Dialogue in Beijing. If passed, the act has great potential to expand economic relations between the U.S. and Mongolia.